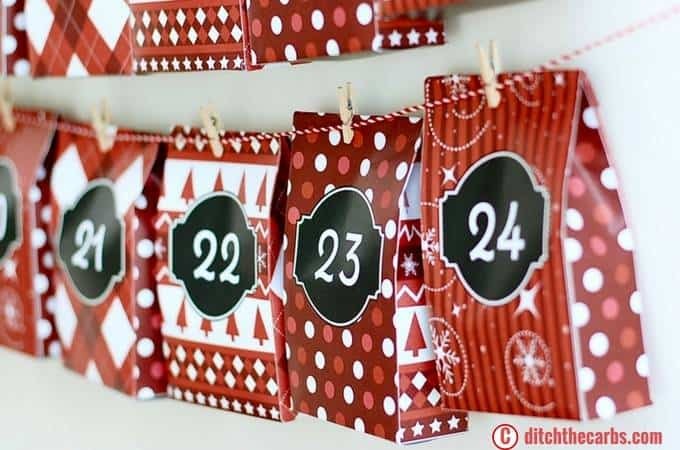 Would you like to make a sugar-free advent calendar this year? Why not make this year really special. Imagine the surprise on your children’s face each morning opening their special little gift and an activity to do together. Make this Christmas one to remember. 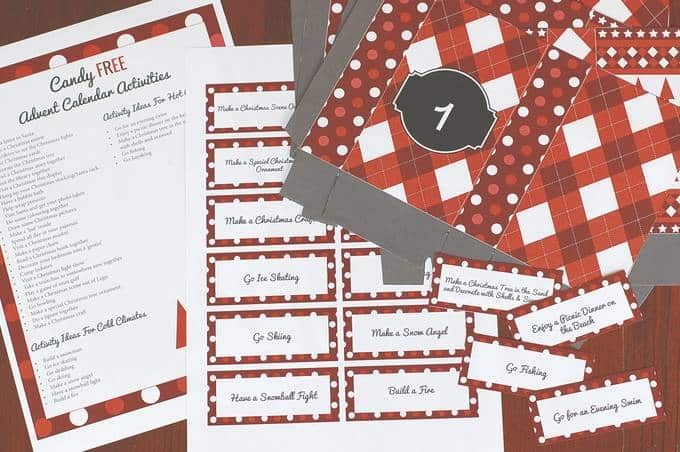 I have free printables and activity ideas for you. I will show you how to make the bags, some amazing gift ideas, and activity ideas – whether you celebrate Christmas in a hot or cold climate. It’s all here, so let’s get started. Each year I look for sugar-free advent calendars. The chocolate that is found inside advent calendars is pretty horrendous. I don’t even know if it is really chocolate or ‘chocolate flavoured’ something or other. 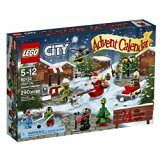 My children love opening their advent calendar each day and last year I bought a Lego advent calendar and a stationery advent calendar. 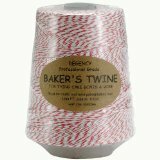 They were such fun each morning, and the gift each day lasted more than the 10 seconds it usually takes to eat a little square of bad chocolate. 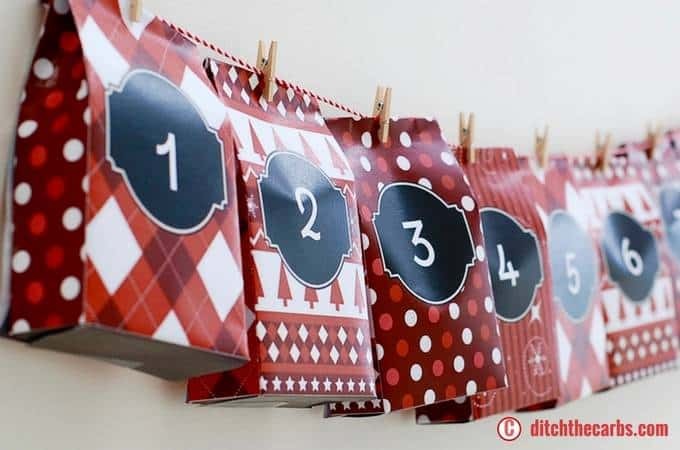 This year I have my own sugar-free advent calendar. Sure it takes time and effort but that’s what makes it special. I sat with my children and we planned suggestions for the gift ideas and activities. So each morning they will receive a small gift and an activity for us to do together. I have included activities for cold climates such as making a snowman or going ice-skating, or for warm climates like us. We will be going kayaking, having a picnic on the beach or staying up late to see the Christmas lights (it won’t get dark here until 9 pm). We might even go camping in the backyard. My children love doing this. 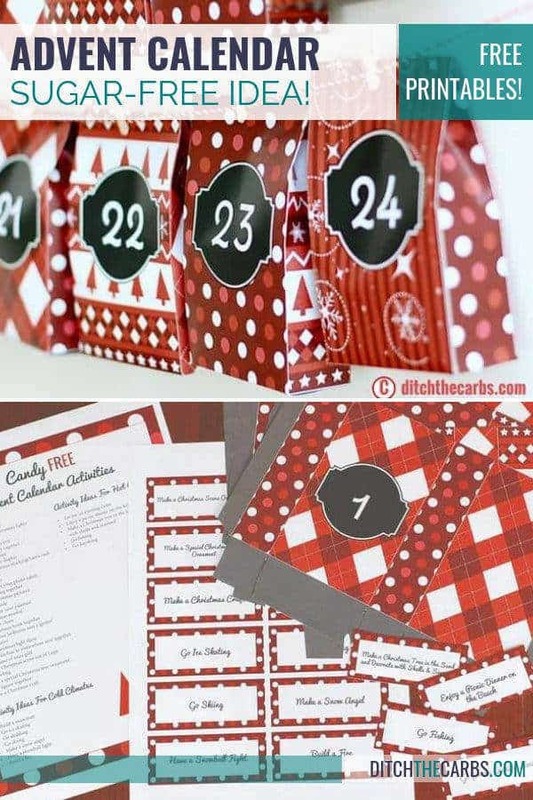 There are even spaces on the sugar-free advent calendar printables to write your own ideas. Ask your children what activities they would love to do with you. 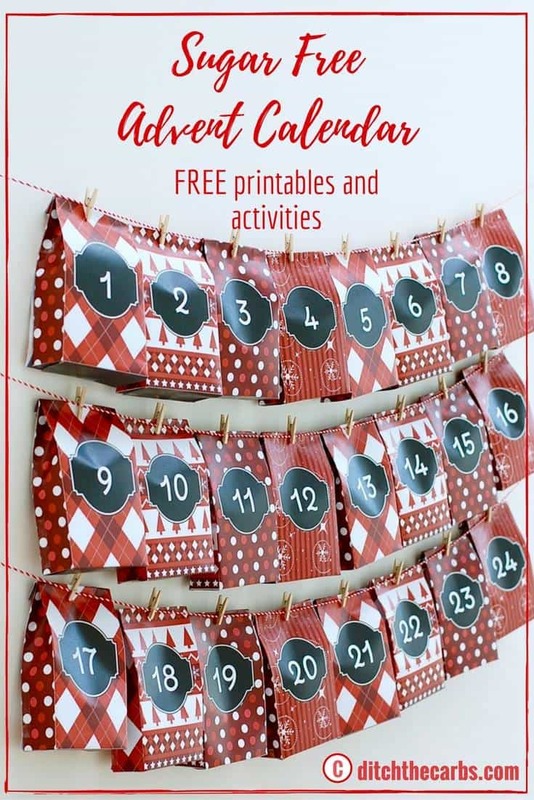 To download your sugar-free advent calendar printables, click on the file you would like to download as a PDF ready for printing. Where would you display them? 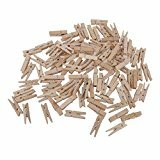 You could place them on a wall, on a kitchen dresser, on a door, or on a whiteboard or cork board. 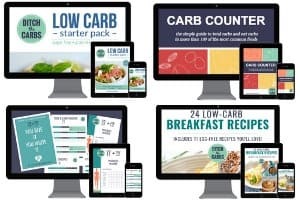 Get ready for Christmas and start planning your healthy low carb meals. Even party menus are included in this book. 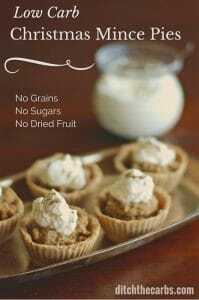 So start celebrating now and treat yourself to this beautiful 21 Low-Carb Sweet Treats – perfect for winter parties, available for instant download. And why not make some sugar-free Christmas gifts too? 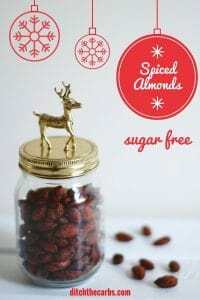 Try my spiced almonds or low carb mince pies. 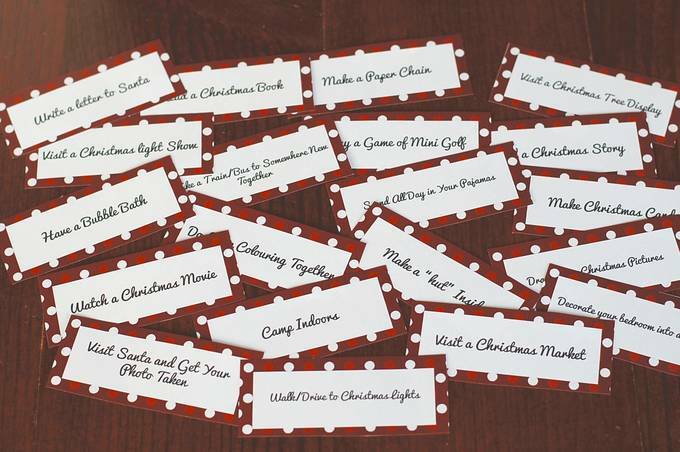 I even have printable gift tags in there for you. Wishing you all a very happy Christmas and healthy new year.